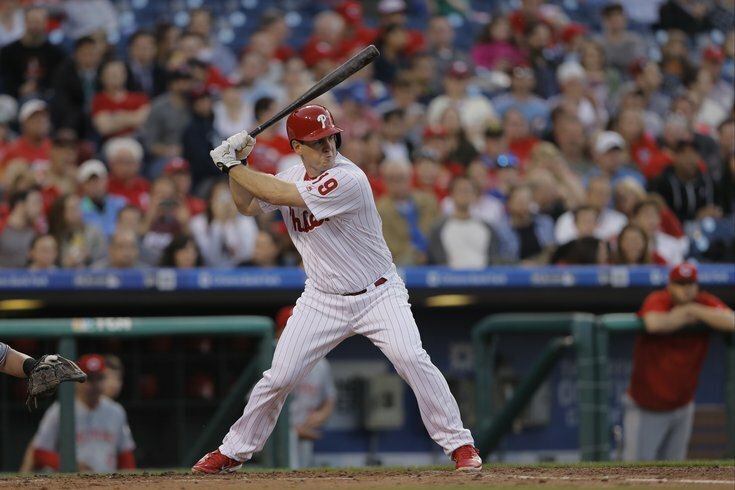 A day after recording his first MLB hit, Tommy Joseph will bat cleanup as manager Pete Mackanin tries to jumpstart the Phillies struggling offense. The Phillies entered play on Tuesday night in danger of losing three games in a row for what would be just the third time in the season’s first 40 games. They haven’t endured a losing streak longer than three games since the first week of the season. To put that into perspective, the 2015 Phillies had their losing streaks of four games or more through 40 games; ditto the 2014 Phillies. Perhaps what makes all the more remarkable is the current Phillies came into Tuesday night 13-7 in their last 20 games despite scoring four runs or fewer in 18 of those 20 games. The offense, second-worst in all of baseball, has been an issue since the start for the overachieving Phillies. The lineup, a daily chore for manager Pete Mackanin. The manager started rookie Tommy Joseph in the cleanup spot on Tuesday night against the Miami Marlins, in Joseph’s third major league start. “Well, we’ve got a new cleanup hitter,” Mackanin said with a chuckle as the media gathered in his office for the daily pregame press availability with the manager. Why plug the fourth spot in the lineup with the 24-year-old who has all of six big league at-bats to his name and was in Triple-A five days earlier? “Why not?” Mackanin said. “That’s pretty much it. … it's frustrating. I don't want to hit Tommy Joseph fourth. I don't want to do that. But in this case, I kind of just said, 'Why not?’"
As the first-year manager of a rebuilding team, Mackanin has what he has at his disposal everyday and that’s that. It’s a part of the deal he agreed to when he took over, and even though the pitching staff has overachieved and the team is currently in striking distance of both Washington and New York in the National League East, Mackanin also can’t lose sight of the fact that the Phils are only at the quarter pole of the season and the big picture is far more important than reacting to a surprising start. The collection of corner outfielders are largely made up of defensive-first placeholders that aid the pitching staff in covering ground, but not in providing nightly run support. Like right fielder Peter Bourjos, who has made his 33rd start of the season on Tuesday. It's more important that [our prospects] develop at the right time because it is a rebuilding thing and we don't want to rush those guys. Here’s a stat to chew on: despite the fact that Bourjos has started the vast majority of games in right field, the Phillies actually have a better OPS from their right fielders (.519) than from their left fielders (.517) this year. And it’s easy for a manager – a competitive sort whose chief concern is winning each night – to daydream about the potential of adding a prospect into his lineup the way his team is winning. But, again, the big picture. “It's more important that they develop at the right time because it is a rebuilding thing and we don't want to rush those guys,” Mackanin said. “(Outfield prospect) Nick Williams is hitting the ball OK, but he doesn't have a lot of home runs. He's not hitting for power. We know he will. Mackanin understands some of his prospects – Williams, fellow outfielder Roman Quinn, catchers Andrew Knapp and Jorge Alfaro and even shortstop J.P. Crawford – could be “trickling in” at some point later this summer. And they could spark the offense. But, until then, he waits. The first possible upgrade Mackanin could get for his offense could come within the next week or two, though. Cody Asche, who began the season on the disabled list with an oblique injury, was scheduled to play in his fourth rehab game at Class A Clearwater on Tuesday before the game was postponed by rain. Asche had two hits in his first three games, including a home run. Cameron Rupp had his catcher’s gear on, likely ready to catch a side bullpen session before the Phillies pregame batting practice was washed away by rain on Tuesday. Rupp was out of the lineup for the third straight game after turning his left ankle in Saturday’s game-ending collision at home plate. Mackanin said he believed Rupp would be ready to hop back in the starting lineup on Wednesday afternoon, but was leaning toward giving him an additional day since the Phillies have a scheduled off day in their schedule Thursday. By keeping Rupp out Wednesday, Mackanin would have his starting catcher rested for five straight days heading into this weekend’s series against the Atlanta Braves at Citizens Bank Park.